UMETSU SHUZO / Ume Sake "Nokyo". Special Ume Sake "Hanatenjin"
"Nokyo" ume is a very precious brand of ume, grown only to specific land in Tottori Japan, and different from the other ume, grown to 5-6cm in diameter, When the ume ripens into full maturity, it's the biggest in Japan. Its sour smell is sweetly shrouded in an open field at the season when the ume fully ripens. Usually raw ume cannot be eaten. However, the fully ripened "Nokyo" ume can be eaten as it is. By having had the good fortune of finding the "Nokyo" ume, we began producing the Ume Sake "Nokyo" and "Hanatenjin". Ume are not plums. They are often mistaken for European plums which are in the same group of Rosaceae Prunus. However they have different features. is also especially considered a very superior brand of ume in Japan. Small amounts are grown in specific areas in Japan. They become juicy, sweet and sour when they ripen into fully maturity. To produce Ume Sake "Nokyo", the "Nokyo" ume is first soaked in a "Sake barrel" for several years until its flavor is well extracted in the sake. Two or more years later, when the ume flavor is well extracted from both the fruit and the seed, we remove them from the sake barrel. 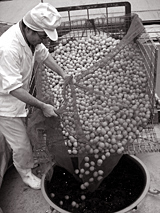 This means that after this process, you can enjoy our delicious Ume Sake. 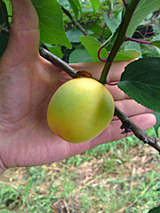 Ume flavor is extracted not only from fruit but also from the seed. The seed's flavor is extracted by the effect of sake. This means you get to enjoy the fruit's rich taste. Drink some to savour the delicious fruity flavor. "Nokyo" contains organic acid, vitamin and amino acid from ume. "Hanatenjin" is made from ume fruits and seeds soaked for at least two years. These are then crushed and squeezed to produce "Hanatenjin"
You can enjoy the rich taste and noble flavor from the soaked ume fruits. The hard seed has small contents inside called "Jin". Japanese like to eat them for better health. 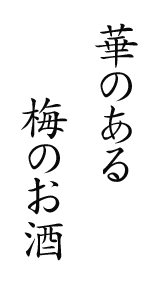 "Hanatenjin" contains the extract of the "Jin".